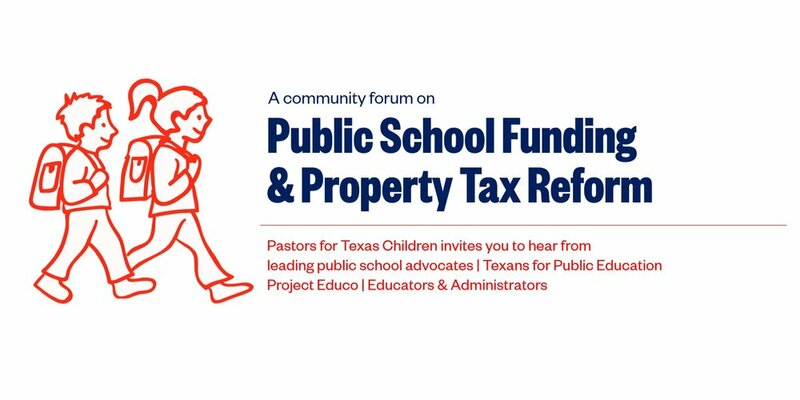 As the 86th Texas Legislature considers reforms for public school funding and property taxes in our state, Pastors for Texas Children is hosting a panel of public education advocates, teachers, administrators and experts for a moderated discussion about key issues, impacts and potential paths forward. The audience will be invited to participate in a Q&A session at the end of the program. All community members and area public school parents are invited to attend! Doors will open at 1:30pm with an opportunity to mix and mingle with our panel members. The program will begin at 2:00pm. When you arrive, please sign-in at the table to receive your nametag and forum handout.